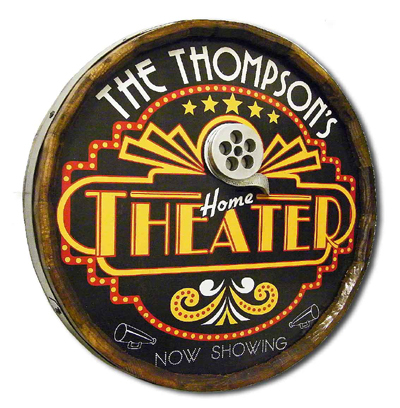 An Art Deco Inspired Multi-Color LED Illuminated Laser-Cut Sign enhances Your Home Theater or Media Room. Stately placed upon a table, desk, or shelf introduces your friends and family to your theatrical room. 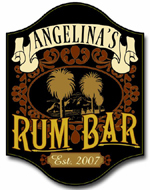 This Illuminated Sign is equipped with Multi-Color LEDs and Full Function RF Remote Control. Choice of either a Rectangular (Black Painted) or Stepped (Black Acrylic) Base. Add the Recommended Black-Backer to Block the See-Through aspect of the Acrylic, which enhances brightness of the LEDs Vibrant Colors. Make all selections below, including Personalization. 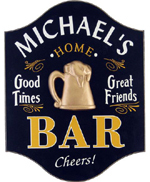 A Marquee Inspired Multi-Color LED Illuminated Laser-Cut Sign enhances Your Home Theater or Media Room. 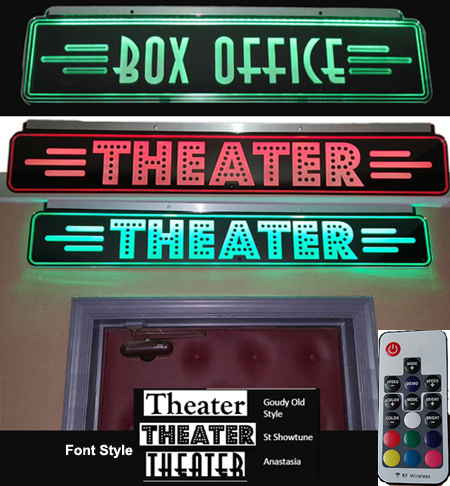 A Theater Marquee Inspired Multi-Color LED Illuminated Laser-Cut Sign enhances Your Home Theater or Media Room. Made From An Authentic Wood Quarter Barrel. Personalized with the Name of your choice. No character limit. D-ring hanger on back for easy door or wall mounting. 21 inches round x 5 inches deep. Provide the Personalized Name, with or without an apostrophe S (‘S). We will print exactly as provided. Professional Dressing Room Door Stars. Precision Laser Cut Brushed Metallic Acrylic. Personalized with a Name or Text. Keep in mind that the greater amount of text, the smaller the font size to fit onto your Star. Available in Bright Brushed Gold or Bright Brushed Silver. 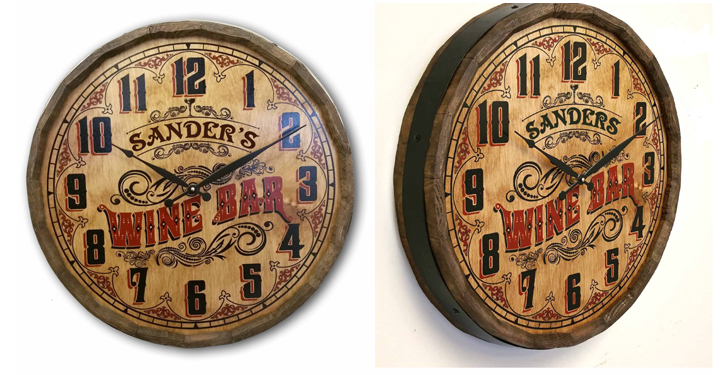 Made From An Authentic Wood Quarter Barrel with Raised Relief. Provide the Personalized Name, with or without an apostrophe S and with or without the word "The". We will print exactly as provided below. Looking for a Unique and Personalized Gift for your friend, family, or yourself? 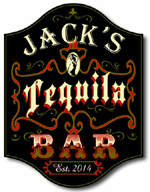 Our Personalized Bar Mat for the Man Cave or Home Bar. Choose from THREE Extraordinary Designs fabricated from durable and long-lasting half inch thick Rubber Material. 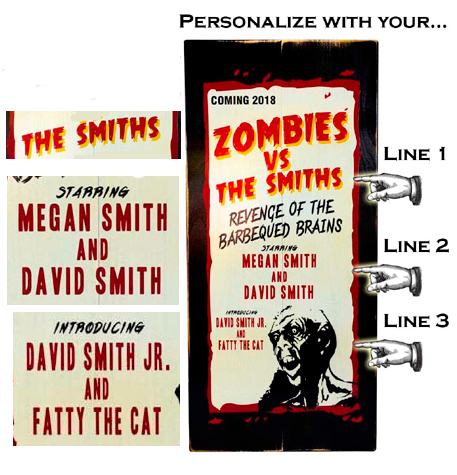 Personalize with 1 line up to 15 characters (with or without an apostrophe S), and year established. Typically ships within 3-4 days. 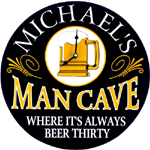 Man Cave - Got Beer? 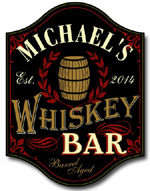 Home Bar - Got Beer? 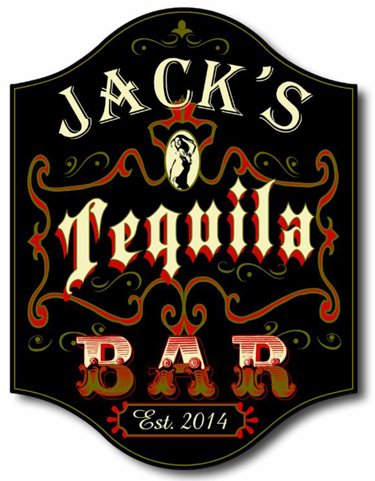 Our Marquee Style Wall Mount Laser-Cut Marquee Sign with Multi-Color LED Illumination. Stately Mounted on a Wall, or over the Entrance Door. 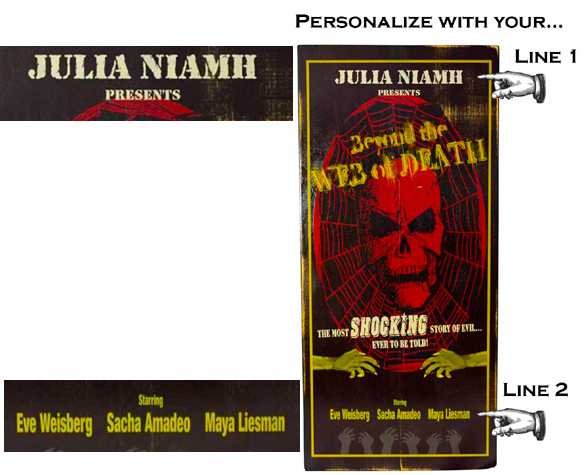 Welcome your friends and family to Your Theatrical Cinema, or whatever personalized Wording of Your Choice. You have the Choice of Three Font Styles for your Personalized Text. A Black-Backer is included that Blocks the See-Through aspect of the Acrylic, which Enhances the Brightness of the LEDs Vibrant Colors. Make all selections below, including your Wording Personalization. 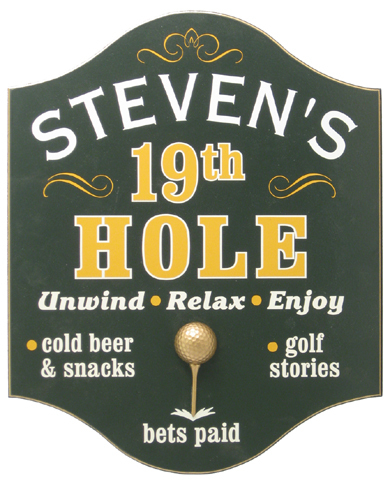 Our Art Deco Style Wall Mount Laser-Cut Marquee Signs with Multi-Color LED Illumination. 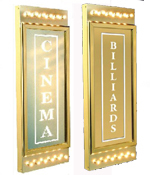 Stately Mounted on a Wall, or over the Entrance Door will Welcome your friends and family to Your Theatrical Cinema. Available in your Choice of Two Art Deco inspired Designs. 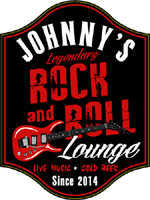 The Illuminated Signs are equipped with Multi-Color LEDs and Full Function RF Remote Control. You also have the Choice of Three Font Styles for your Personalized Text. Decorate Your Home Theater, Media Room, Home Bar, or Game Room with Our NEW Majestic Marquee. 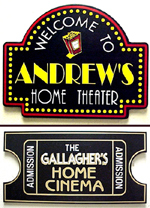 Your Personalized Marquee Showcases Your Theater Name, Family Name, or Customized Saying. Your Majestic Marquee Will Be Unique, Putting Your Name in Lights! You`ve Worked Hard to Create The Room of Your Dreams, Now Complete it with The Majestic Theater Marquee. Customize not only the Marquee Message, but also the Wood Color Finish and Illumination! The Majestic Marquee is offered in Your Choice of Six Color Finishes, and Non-Illuminated, White LED, or Color LED lighting options! The Color Illumination uses RGB LED technology, where all different Color Shades, including White, can be seen. Solid color, strobe, flash or color rotation settings can be chosen by a simple remote control selection. You can dim or brighten the illumination to get the perfect shade. Add the optional 2.5" LED Down Lights. 2 Lights on the 42" and 49" Marquees, 3 Lights on the 59" Marquee. Also available is the optional Broadway Style Font. Add the optional Film Reel Ends on the 71" W Marquees. -- Back-lit with low voltage, energy-efficient LED lights. -- UL Listed - Please contact an electrician when trying to hard-wire or dim this unit. Introducing our NEW ORPHEUM MARQUEE. The Orpheum Marquee is designed to fit above a set of double doors, or any other location, and displays any custom text (theatre name, phrase, title etc.) with eye catching detail and optional illumination! 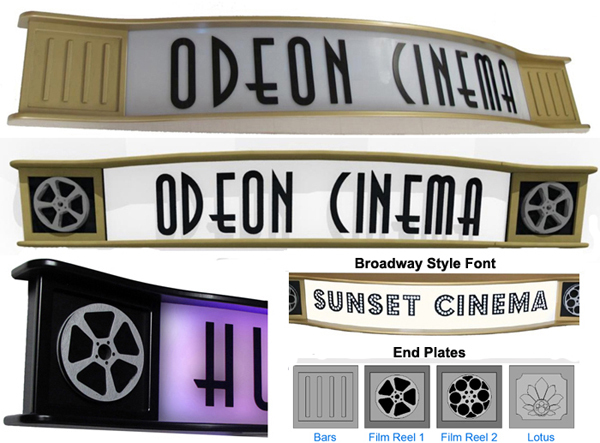 The Orpheum Marquee features your Choice of TWO LENGTH SIZES 72" or 93"
Antique Gold, Hammered Gray, Hammered Black, Hammered Silver, Hammered Bronze, or Black Galaxy. Choose to light up your Marquee with optional White or Multi-Color LED illumination. Optional remote controlling. The Color Illumination uses RGB LED technology, where all different Color Shades, including White, can be seen. Solid color, strobe, flash or color rotation settings can be chosen by a simple remote control selection. You can dim or brighten the illumination to get the perfect shade. You also have the choice of the Vertical Bars Design or of the two optional 3D Raised Film Reel or 3D Raided Lotus Design End Plate Decorations. -	UL Listed - Please contact an electrician when trying to hard-wire or dim this unit. CLICK HERE To View Color Finishes. REAR-ILLUMINATED MARQUEE WITH 64 PERIMETER 1-INCH DIAMETER CHASE LIGHT BULBS. 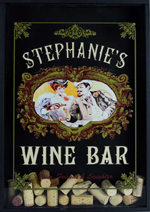 The Perfect Changeable Marquee to mount over the Entrance of your Theatre or in your Lobby or Concession Area. A Complete Set of 125 BIG 4 inch Letters and Numbers Included. 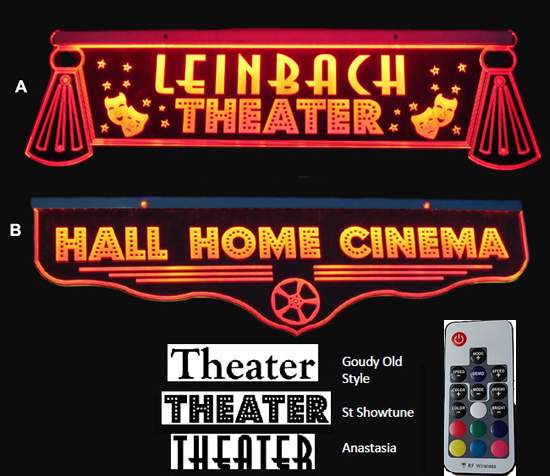 Easily change the lettering to introduce guests to your theatre, the name of tonight`s feature, or change the wording for a Special Event or Holiday. 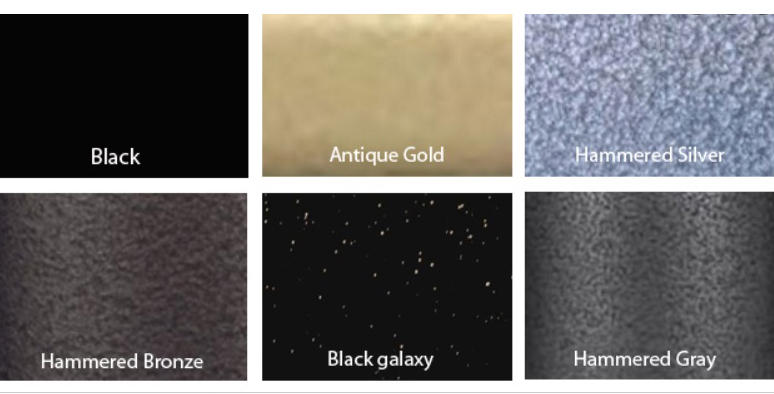 --Your choice of metal finish. PUT YOUR NAME IN LIGHTS WITH THE SPECIALTY TWO-LINE MARQUEE! 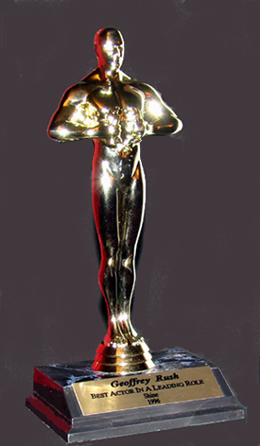 The Highly Detailed Golden Award Figure Stands Atop An Attractive Base. 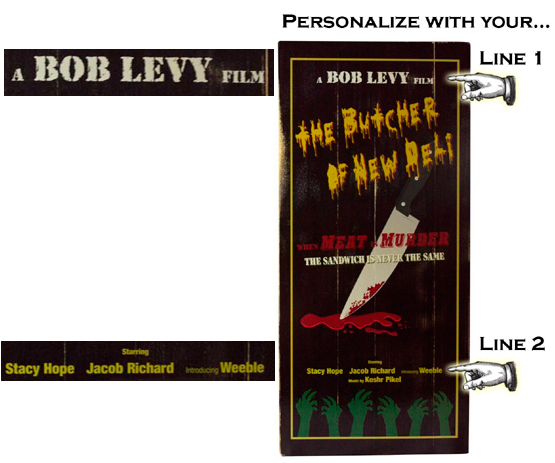 Customize The INCLUDED Plaque With The Text Of Your Choice. Provide Your Personalized Text below, 1 to 4 lines of text. 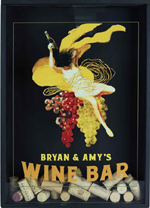 Introducing Our NEW Pop Art Wooden Plank Lithographic Man Cave Sign with Handmade Sculptured Relief. 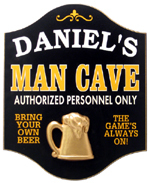 Good Times...Great Friends....Sporting Events...What Happens In The Mancave, Stays In The Mancave! 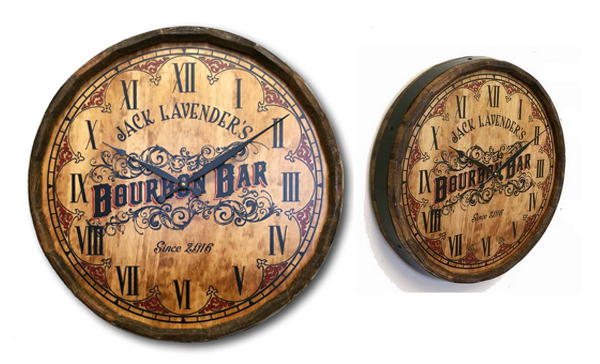 Handcrafted in the USA of Furniture Grade Wood Planks and Professionally Printed Using Proprietary Poly-Arch Lithography. The Sculpted Relief is Made Entirely In-House by Staff Artisans. The Personalized Nameplate with No Reasonable Character Limit. Large 24 in. x 11 in. x 1 in. 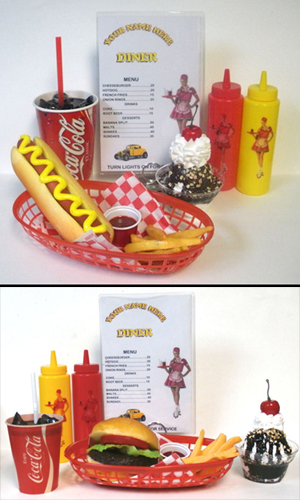 The Meal Setting includes French Fries and Ketchup Cup, Coke with Ice and Straw, Red Plastic Basket with Liner, Mustard and Ketchup Diner Bottles, Your Choice of a Hot Dog or Cheeseburger (with lettuce and tomato), a Cherry Topped Sundae for Dessert, and a Personalized Menu. The Popcorn is held together with resin (will not spill), and the drink is a solid tinted resin that looks like the Real Thing. The Bun has a soft touch. Perfect for table center pieces. Select either the Cheeseburger or Hot Dog Meal Setting, and the Name on your Personalized Menu. Provide the Personalized Name, with or without an apostrophe S and the Year. 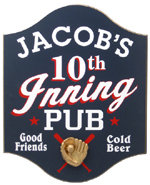 Welcome your guests to MY 10th INNING PUB. Customize these wooden signs with your name, or the name of your best friend, husband, or loved one. Three Dimensional Resin Relief Emblem at the Bottom of the Plaque. 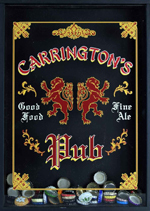 Provide The Exact Personalized Name below, with or without an Apostrophe S.
PERSONALIZED PREMIUM BEER CANVAS SIGN. 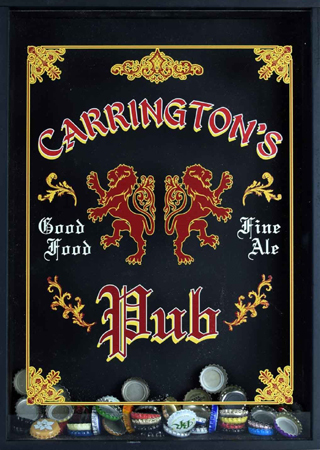 Show off Your love of Good Beer with our Premium Canvas Sign. Personalized with the Name of your Choice. One Line, up to 30 Characters. Big 24 in. x 18 in. 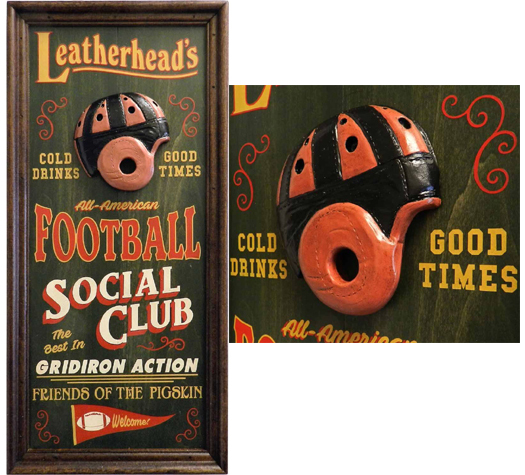 The Perfect Personalized Wall Decor for the Bar, Game Room, or Man Cave. Provide Personalized Name (with or without an apostrophe) below. 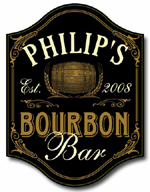 Are You Wanting To Personalize Your Home Bar with a Touch of Class and Sophistication? Or Maybe You Need a Special Gift for a Friend or Family Member? Well, This Personalized Bar Mirror is The Answer. Each Mirror is Complete with a 24" x 18" Black Wooden Frame and Includes an Inset Matte Surrounding The Mirror. Choose from Three Design Colors: White, Black or Gold Ink. Overall Measurement 24" x 18"
PERSONALIZATION: 1 line up to 15 characters, with or without an apostrophe S, and Est. Year. 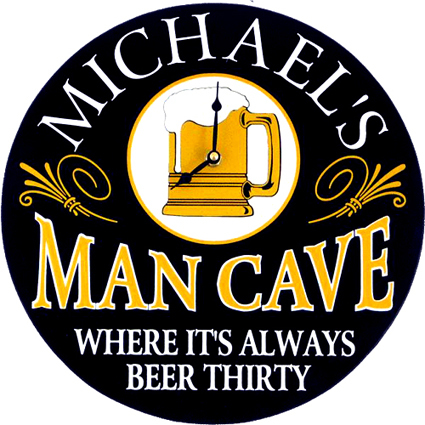 Welcome your guests to MY MAN CAVE. Authorized Personnel Only. Bring Your own Beer, The Game’s Always On!!! This is the same marquee used by your neighborhood theatres. Large 4 inch acrylic lettering is easy to change. Announce Tonight`s Movie Title, The Name Of Your Theatre, or Special Occasion. 5 in. Deep x 6 in. High. -Choice of 38 in. or 50 in. Length. -Choice of five metal finishes. 5 in. Deep x 16 in. High. 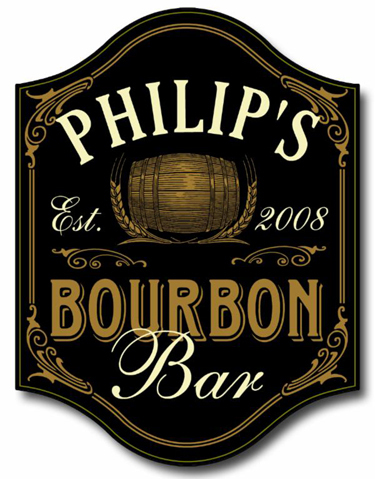 Handcrafted to the standards of the Classic Vaudevillian times, our Wood Sign Features a Handmade Wood Frame and Sculpted Relief Helmet. 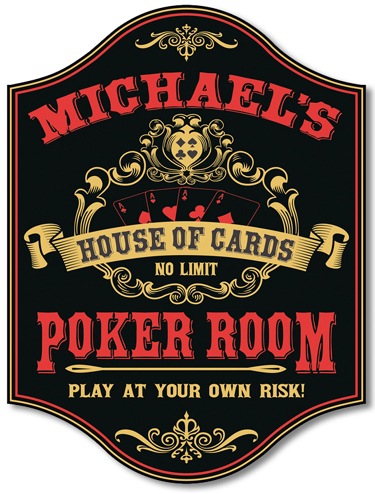 Made by using proprietary Poly-Arch Lithography, each Sign is individually made upon order. From cutting and preparing the wood to painting, printing, hand lettering, and distressing each sign. Hanging Hardware is Included for Mounting. 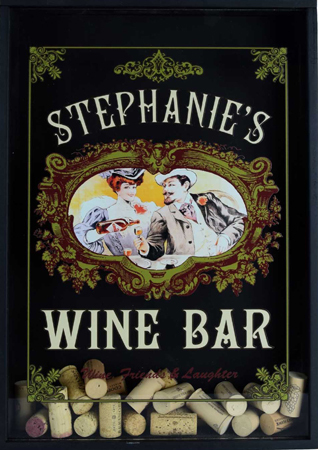 Overall: 11" x 24" x .5"
PERSONALIZED WINE BAR CORK CATCHER. Proudly Handcrafted in the USA. Fabricated of Fine Furniture Grade Wood Frame and Glass Front. 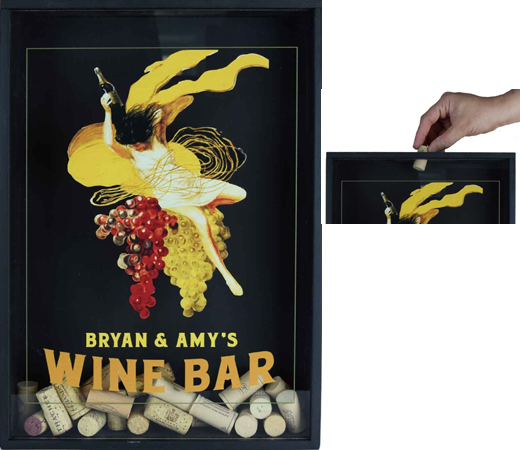 The 3 inch Frame Depth provides ample space for your assorted Bottle Corks as they start to fill from the bottom of the Vibrant Graphic. The Graphic is Personalized with one line of your choice of Text. 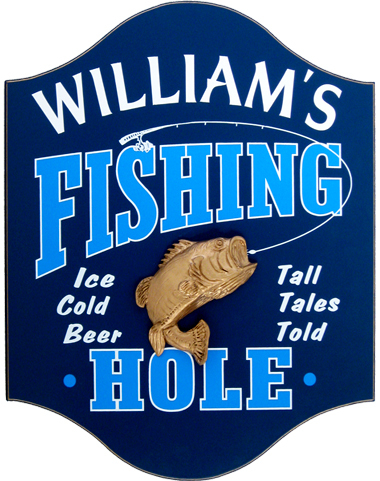 A Key Hole Hanger on back makes it easy for door or wall mounting. The Hinged Top Opens for adding or removing Corks or Bottle Caps. Size 16.5" x 12.5" x 3"
Allow 3-5 days for production! The 3 inch Frame Depth provides ample space for your assorted Bottle Corks and Caps as they start to fill from the bottom of the Vibrant Graphic. The Clock requires 2 AA Batteries. Personalized with the Name and Year of your choice. No character limit. Provide the Personalized Name, with or without an apostrophe S.
The Year with 4 digits. PERSONALIZED POP ART WOODEN PLANK LITHOGRAPHIC CIGAR BAR SIGN With SCULPTURED RELIEF. Each is a Unique Piece of Art Personalized with your NAME (with or without an apostrophe S) and four digit DATE. Large 24 in. x 11 in. The Mirror is made from 1/4" Glass, Mounted on a Wooden Backing, with a Wood Frame. Personalize your Mancave Mirror with any Title Text or Name. Provide your personalized text exactly as you want it to appear with or without an apostrophe S.
Notice the Bottle Top reflection in the Mirror (Zoom Image). Please allow up to 2 weeks for fabrication, followed by shipping. 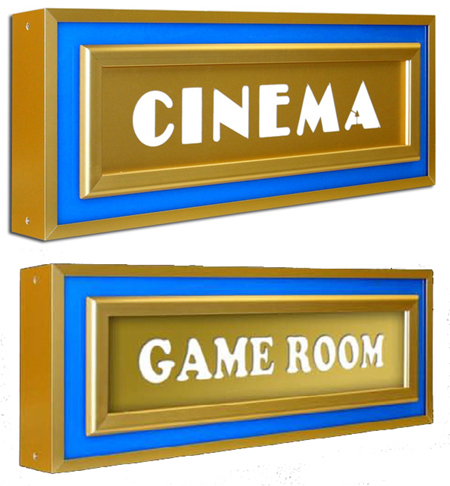 Dimensions: 28" x 13" x 1"
Personalize your Gameroom Mirror with any Title Text or Name. 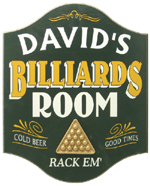 Provide your personalized text exactly as you want it to appear with or without an apostrophe S.
Personalize your Billiards Room Mirror with any Title Text or Name. 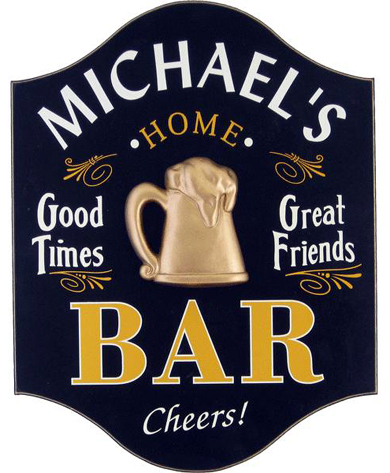 Provide your personalized text exactly as you want it to appear with or without an apostrophe S.
PERSONALIZED Laser-Cut Heavy Gauge, Curved Black Metal Sconces. The Name Of Your Theatre In Lights! Your choice of THREE CUSTOM-MADE SCONCE Designs. Place you mouse pointer over the picture to view the available designs. Please allow up to 6 weeks for production of your personalized sconce. Provide your Complete Custom Text below. 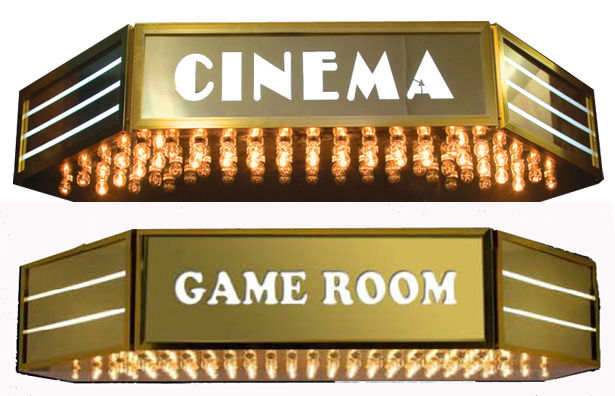 Your Choice of a Fully Illuminated Professional CINEMA or GAME ROOM Entrance Sign with rows of light bulbs beneath the sign. The wording is laser-cut in the metal facade. 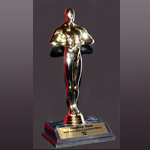 Mount on the wall above your entrance doorway or at the entrance to your theatre lobby. Your choice of Metal Finish. 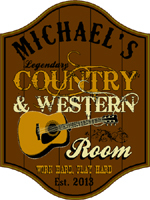 Or you can Personalize the Marquee with your name or special wording for an additional $475.00. Provide your custom name or word below. Please allow 3-6 weeks for fabrication. Rear-Illuminate your choice of GAME ROOM or CINEMA. You also have the choice of Four Acrylic Perimeter Matte Colors that Create The Halo Effect. 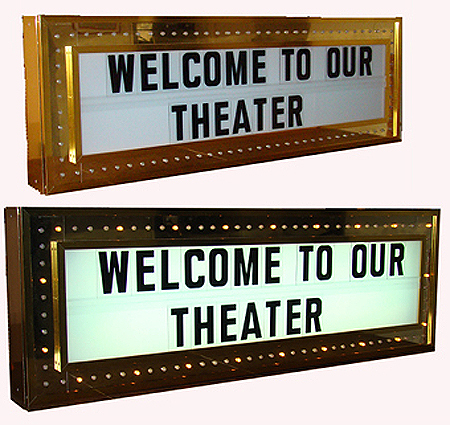 Or Personalize the Marquee with the Name of Your Theatre or other Wording. Your choice of Matte Halo Color (blue shown). 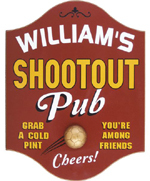 A Popular, Attractive, Illuminated Identification Marquee. Please allow 2-4 weeks for fabrication. 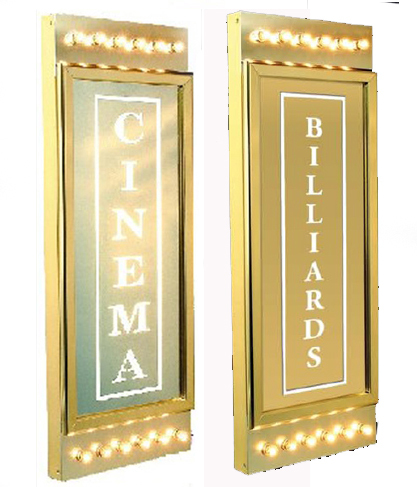 Two Rows of Marquee Lamps and Rear-Lighting Illuminate This Professional CINEMA or BILLIARDS Entrance Sign. 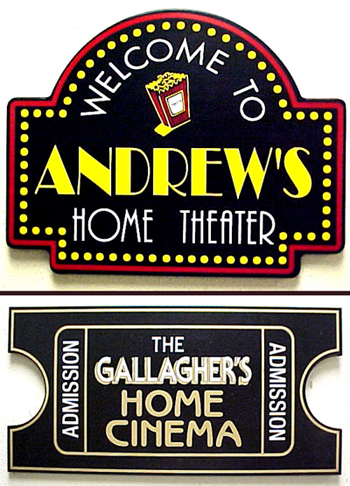 Mount flat on the wall above your entrance doorway or at the entrance to your theatre lobby. 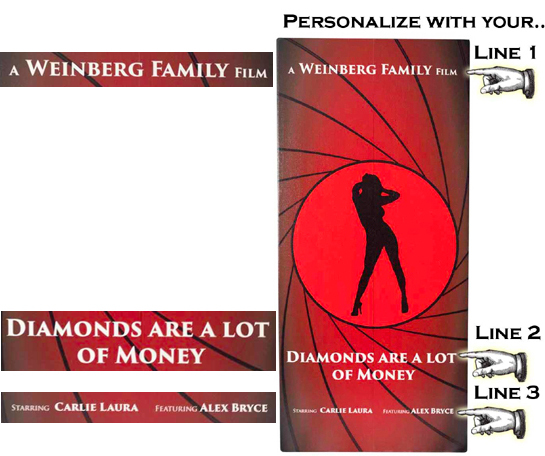 A Row Of Accent Bulbs Separates The Personalized Rear-Illuminated Identity Panel From The Rear-Illuminated Poster Frame! 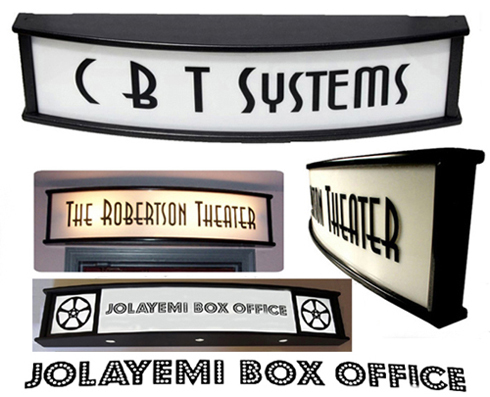 Customize your Marquee with your Family or Theatre Name. Changing posters is a snap with the integral Snap-Lock Frame. The Marquee is available in your choice of finishes. Provide your personalized name text below. Made-to Order - Please allow 3-4 weeks for custom fabrication followed by shipping. 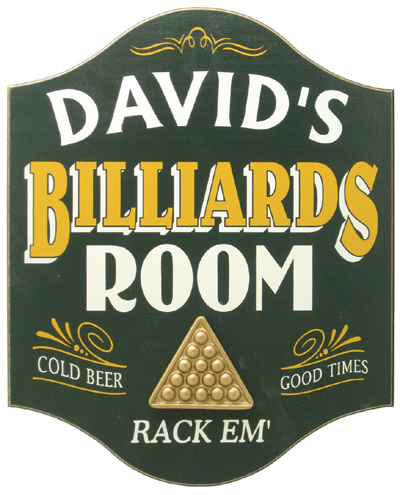 Welcome your guests to MY BILLIARDS ROOM. Welcome your guests to MY TOUCHDOWN TAVERN. Cheer - Shout - Enjoy! Cold Beer & Snacks. 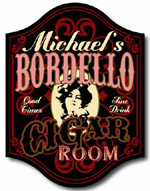 PERSONALIZED BORDELLO CIGAR ROOM PLAQUE. 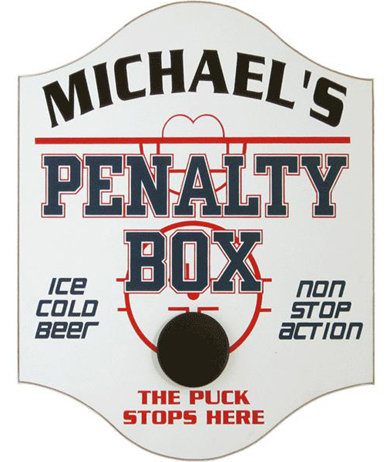 Welcome your guests to MY PENALTY BOX, Where The Puck Stops Here! Ice Cold Beer! Non Stop Action! 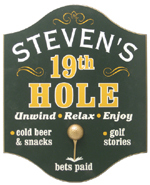 Welcome your guests to MY 19TH HOLE. 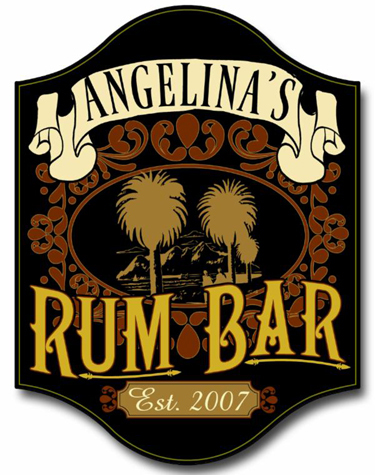 Welcome your guests to MY BAR...Cheers! Three Dimensional Resin Relief Emblem at the Center of the Plaque. 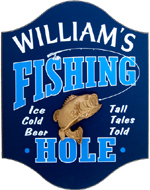 Welcome your guests to MY FISHING HOLE! Ice Cold Beer! Tall Tales Told! 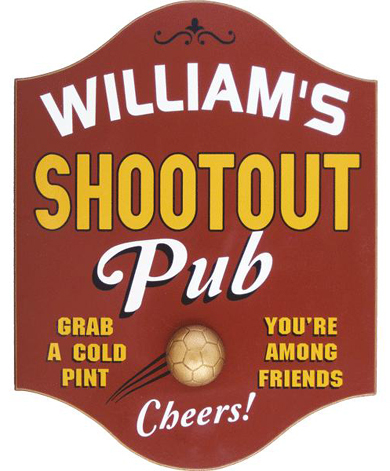 Welcome your guests to MY SHOOTOUT PUB...Cheers! 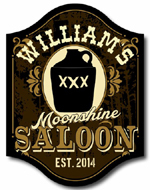 Grab A Cold Pint! You`re Among Friends! 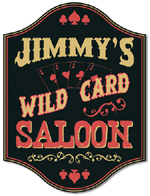 PERSONALIZED WILD CARD SALOON PLAQUE. 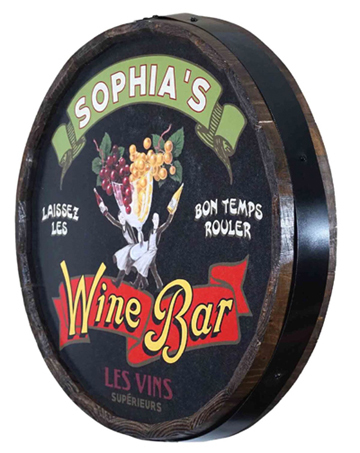 This Personalized Wood Plaque is Made of Oak from the Ends of Authentic Barrels which will add a great Rustic Look to your Decor. 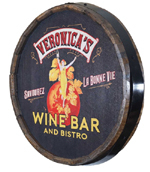 Each Wood Sign is made from Real Wine Barrels Ends that Measure roughly 20 in. Round and 3 in. Thick. Personalize with Your Name up to 20 Characters (with or without an apostrophe), and 4 digits for year. This Item Usually ships in 2-3 business days. This Framed Personalized Man Cave Pool Room Themed Plaque Boasts a 1950s Vintage Vegas Motif and Makes the Perfect wall Decor for Your private Room. Personalization includes First and Last Names and Established Date. 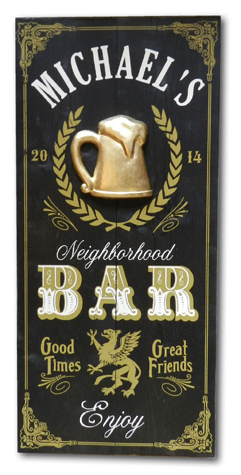 Outfit your Man Cave with a one or more these lavish 25 ounce Mugs with handsome Gold Rim. 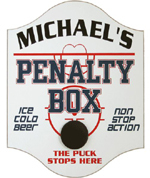 Makes an ideal Personalized Gift for anyone who enjoys Sharing an Ice Cold Brew. Personalization includes up to three Initials. Outfit your Man Cave with a one or more these Manly Personalized Mugs. Beer Drinkers and Mug Collectors will love this Unique Metal-Coated Mug with Custom Pewter Medallion. The Contemporary Classic Mug holds 16 Ounces of Brew and includes a Sturdy Base, Slim Handle, and Sleek Lines. Personalization includes One Line up to 15 characters. 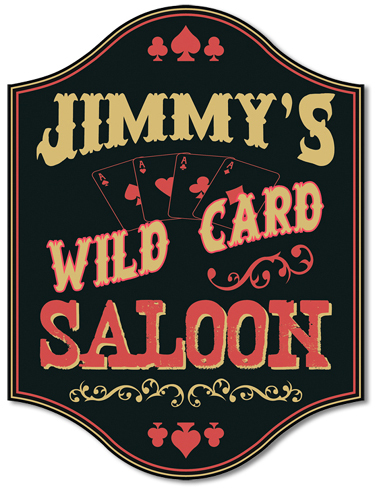 Our Personalized POKER Coasters are the Perfect Accessory to any Family Bar or Game Room. 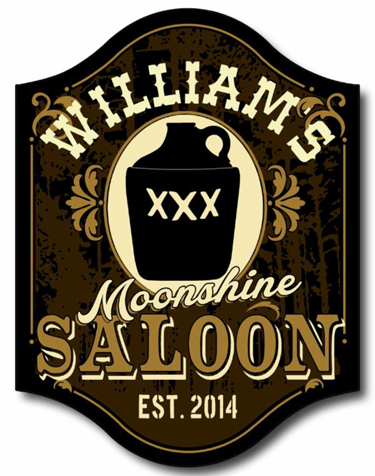 This Set of FOUR Richly Detailed, Waterproof Coasters are Printed in Full Color. Non-skid Cork Base and a Mahogany Holder for All Four Coasters. Each Coaster Measures 3 3/4 in. Square. Personalization includes Name (up to 15 Characters) and Established Date (4 characters). 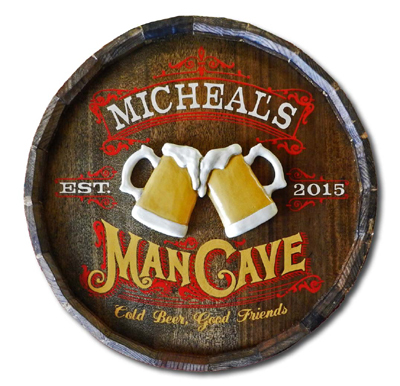 This Exquisite Mancave Sign is Made from a REAL wine Barrel Head. 19 in. Diameter, 3 in. Deep. 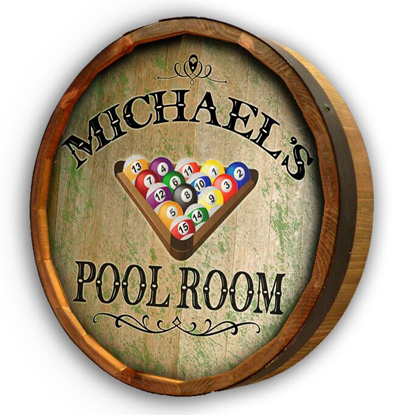 PERSONALIZED OFFICIAL POKER ROOM BARREL HEAD. This Exquisite Poker Room Sign is Made from a REAL wine Barrel Head.